We’ve all been there, things are going along swimmingly and then suddenly we hit a lull in business. It’s scary financially, and if you’re like me, after about 48 hours you’re thinking no one will ever hire you again and you should just give up and WHAT THE HELL WERE YOU EVEN THINKING?! Then you drink half a hard cider, pass on the couch while watching CSI:NY, and wake up the next morning feeling like a hungover loser. It’s cool though, because after you repeat this process a few times you’ll realize that lulls in business can be FUN. And they can actually help you improve your business and make it better! So stop drowning your sorrows in Angry Orchard and cheesy crimes, and do one of these instead! One of the reasons you might be in a slow period is because your audience may not know that you have a spot available for them. Let them know! Send out an email, and share on social media. You don’t want to sound desperate, so I don’t recommend saying you’re available immediately, but a quick, “Hey, I have one spot available for September!” can result in getting your schedule booked for the next month or two. This is something I wish I did more often–creating a backlog of blog posts for when I’m too busy to blog. Having a collection of posts you can schedule for when things pick back up means you won’t be scrambling for a blog post when you really need one! Passive income is awesome, and I’ve been able to build my income to about $4,000/month which is a really nice bonus! The problem is that when I’m busy with client work I have trouble finding the time and motivation to work on products that will bring me more passive income–so I enjoy lulls in my business that allow me to get this work done! The added bonus of products like courses and books is that they allow clients who might not be ready to invest in your premium offerings to give you a kind of test drive to see if they’d like to hire you in the future–so even free courses and books can be hugely beneficial to your business! With designers, our sites are always the LAST things we work on. We tend to forget to update our portfolios, tweak that wonky bit on our sidebar (because only WE notice it anyhow), and make sure our offerings reflect what we really want to offer clients. So use this time to chip away at that to-do list you’ve been keeping mentally for your own site! Sometimes packages sell like hotcakes, other times we can’t seem to give them away. Use the lull in working with clients to tweak and adjust any design or development packages to what will appeal more to your audience–or nix them completely and start over from scratch! You can use this time to talk to potential clients and figure out exactly what it is they need, and build your packages around this new info. Oh, and while you’re at it, remove ANYTHING from your site you no longer want to offer! What better time to learn something new to improve your business? Whether it’s a class on design, development, copy writing, Twitter, or streamlining your business and communication, use this time to your advantage! If you’re like me you don’t have time for this stuff when you’re juggling clients, so get those mad skillz now! Your new skills can attract more clients, whether the copy on your website is just better, or you’re able to offer an entirely new range of services! Now is a great time to expand your network! Look up in-person events in your area–and go! Make it goal to exchange at least three business cards, and set up a coffee date with at least one person for every event you attend. It sounds daunting at first, but these relationships can result in steady business down the road! How’s your client onboarding? How about your offboarding? What about all that stuff in between? You want your projects to run smoothly, so the time in between projects is the perfect time to work on your processes and get everything streamlined so that when your next client comes along, you’re able to provide them with an amazing experience. Need help? I’ve got you covered! It can be hard when you’ve got bills to pay, but if money isn’t an immediate issue (because you have savings like a good entrepreneur, right?) treat yourself to some quiet reading time, mid-day naps, lunch out with a friend, or a clean house (because who has time to clean when they’ve got client projects?). You don’t have to actually go anywhere (unless you want to! ), but use the time to relax and recharge and do something for yourself. When work picks back up, you’ll be fully energized and ready to go! Just because business is slow, doesn’t mean it’s a bad thing! 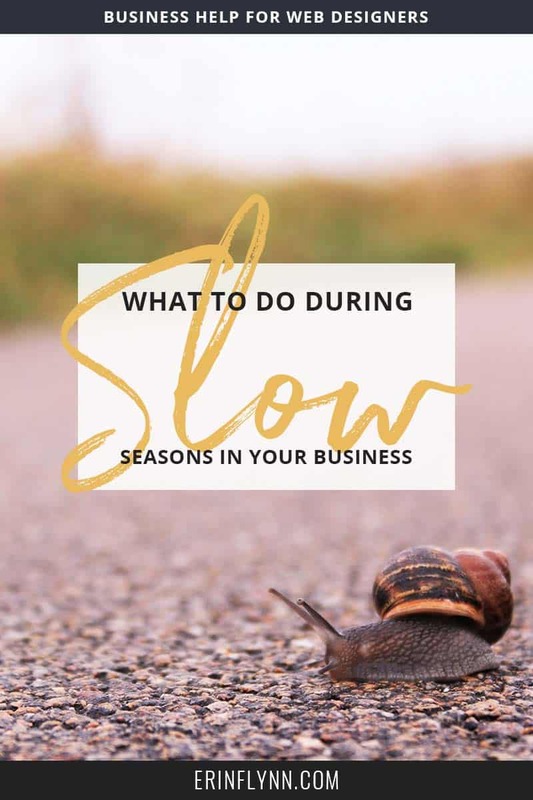 Use one (or a few) of these ideas to keep your business humming along the next time things slow down.